Artisan Emily S. Coleman has been making art professionally since 1972. A graduate of the Montserrat College of Art in Beverly, Massachusetts, and the University of Vermont, Ms. Coleman began studying pottery at the Shelburne Craft School in Shelburne, VT in 1993. At this time, she also studied and worked in the pottery studio of Judith Bryant of Lincoln Potters in Lincoln, VT, and apprenticed with teacher Mary Jane Neale of the Mt. Mansfield Union High School Art Department in Jericho, VT.
After moving to Montana in 1996, where she set up her own business, she studied as a community class student at the Archie Bray Foundation for the Ceramic Arts in Helena from 2004-2006 with then resident artists including Curtis Stewardson, Albion Stafford, Gerrit Grimm, Deborah Schwartzkopf, and Trey Hill. She also participated in a kiln-building workshop at the Bray with Ben Krupka and Curtis Stewardson. 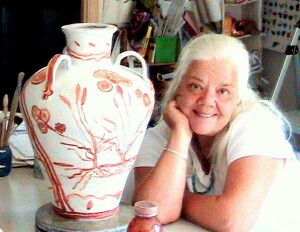 Ms. Coleman completed graduate and independent study ceramics classes at Montana State University with Asst. Prof. Josh DeWeese and Assistant Instructor Elizabeth Sparks, from 2007-2011, and has shown in group and solo shows at the University. 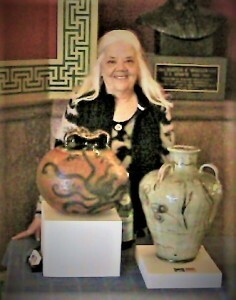 She is a member of NCECA, the National Council for Education of the Ceramic Arts, ICAN the International Ceramic Arts Network, and the Montana Clay Group. Her work has shown at MSU Bozeman, in local galleries and shows, and at the Upper Missouri Artists Gallery in Helena for the Bray 60th Anniversary Downtown Artists Show in 2011. She was chosen as Featured Artist of the Month at Rainbow Ark in Livingston in June 2013 where she exhibited sculpture and pottery in the Finding the Goddess solo show. In 2018, she participated in the annual auction Artrageous!32 at Montserrat College of Art in Beverly, MA. Julia Galloway/Beth Lo at Archie Bray 2015. Tip Toland and Beth Cavener, Sculpting Gesture: Animal and Human at the Archie Bray Foundation in the summer of 2018.